Acid reflux occurs when stomach acids flow in the wrong direction and rise back up toward your esophagus, causing a burning sensation along their way. Ginger is one of the most effective natural treatments for heartburn. Whether powdered, pickled, or fresh, it relieves the pain and discomfort of heartburn fast. Let’s take a look at the medicinal properties that make it such an effective remedy for acid reflux. Is Ginger Good for Acid Reflux? Ginger is well known best remedy for digestion process and it also helps to reduce the back up of contents into esophagus. Ginger regulates the flow of juices in the digestive system to ensure proper absorption of food. It has anti – inflammatory property which reduces inflammation and irritation. Ginger absorbs excess stomach acid and aids in proper digestion. 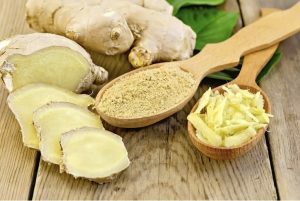 The shagoals and gingerols in ginger soothe taut and stomach muscles by subverting the acids in the stomach. It plays an important role in pushing the food through bowels fast and thus prevents the unwanted formation of gas in the stomach. It has certain phenols which help to relax stomach muscles and thus reduces the over activity of the stomach. It speeds the digestive process to prevent the buildup of gas. Ginger tightens the lower esophageal sphincter to prevent the back-flow of stomach acid. Peel a one-inch piece of ginger root. Crush it to extract its juice. Mix with a few drops of lemon juice. Stir well and drink daily to prevent acid reflux. Peel and grate ginger root. Bland foods like oatmeal and yogurt settle the stomach. Peel and grate fresh ginger. Add this to bland foods and eat. Wash, peel and mince ginger root. Place in frying pan with honey, cinnamon, and ½ teaspoon of butter. Stir over low heat until all ingredients are combined. Place in oven for 10 minutes to get crystallizes. Take out of oven and allow it to cool. Break into chunks and eat to calm acid reflux. Eat this before meals for effective results. Ginger tastes great in stir-fry, rice, quinoa, and soups. Use it as a spice in your cooking as often as possible to prevent acid reflux. Ginger tea promotes proper digestion. It helps to stimulate the saliva production and thus remove acid which has refluxed into esophagus. It as an excellent alkalizing beverage which helps to cure chest pain and also regurgitation that is associated with GERD. You can use either fresh ginger root or ginger root powder in the following recipes. Drink it 20 minutes before meals to prevent acid reflux. Do not take aspirin for at least 2 hours after drinking ginger root tea because both are blood thinners which leads to heartburn and acidity. Peel and mince one inch ginger root. Boil a cup of water and add ginger pieces. Boil if for 5 minutes. Remove from heat. Cover with lid and let steep for20 minutes. Strain and stir in ½ teaspoon honey and lemon juice to taste. Drink 2 times daily before meal to get rid of acid reflux. Optional: You can add 3 crushed green cardamom pods. Stir in 2 teaspoons of peeled and grated ginger root and 1 stalk of chopped lemon grass. Remove from heat, strain, pour in glass. Add any flavor herbal tea bag and let steep 5 minutes. Stir in honey and lemon juice for taste. Drink regularly to reduce the reflux. This spicy tea is low in calories and provides instant energy by reducing acid reflux. Add ginger, orange peel, cloves, and cardamom. Reduce heat and covet it and simmer 10-13 minutes. Add Assam leaves and milk. Remove from heat and let steep 5-7 minutes. Strain and stir in brown sugar. Drink to relieve symptoms of acid reflux. Add ginger and cinnamon sticks. Strain, stir in honey and persimmons. Drink chilled ginger tea to get relief from acid reflux. Add 2-4 drops of ginger essential oil to 1 cup of warm water. Homemade ginger ale is one of the best ways to treat acid reflux. The fizziness induces burping, which relieves pressure in the stomach and intestines, and its probiotics and enzymes sooth the digestive system. It contains high fructose corn syrup which is acidic and helps to promote better digestion. Add it to carbonated mineral water. Add 1 cup of chopped ginger. Reduce heat and simmer 5-7 minutes. Let cool for about 20 – 25 minutes and strain. Boil 1 more cup of water. Stir in 1 cup of sugar. When the sugar has dissolved, set it aside to cool. Mix ½ cup of ginger water, 1/3 cup of sugar water, and ½ cup of club soda (or carbonated water).. Squeeze in the juice of 1 lemon. Add 1 ½ cup of fresh sliced ginger, 1 ¼ cup of sugar and 1 ½ cup of water to a medium saucepan. Bring this to boil over medium heat and stir it well to dissolve the sugar. Then lower the heat and simmer for 20 minutes. Strain the syrup and allow it to cool to room temperature. Add 1 ½ cup of freshly squeezed lemon juice in it and stir it well. Stir in 2 tablespoons of this ginger syrup to 8 ounce of glass. Make sure to fill three quarters full with club soda. Stir it gently and add ice and more of club soda or syrup (as per your requirement). Drink this ginger ale to get relief from the acid reflux. Stir in 2 tablespoons of peeled and minced ginger, ½ cup of organic sugar, and ½ teaspoon of sea salt. Reduce heat and simmer 5-7 minutes or until sugar has dissolved. Stir in ½ cup of fresh-squeezed lemon juice and ½ cup of ginger bug. Transfer to 2 quart mason jar and twist the lid on tight. Leave out 2-3 days or until carbonated. Then keep it in refrigerator for overnight. Very carefully open the jar because it should be bubble and should ‘Hiss’ like soda when it do while the lid is removed. Always check that it should smell ginger and it should be slightly of yeast / fermentation and it should be fizzy. It should not become too carbonated as this will cause too much pressure and thus results in exploding the jar. Strain, pour into another jar, and refrigerate. Drink this ginger ale to get rid of acid reflux. Taking 1000mg of ginger supplement capsules every day will help to regulate the digestive system and prevent acid reflux. Ask a doctor about dosage or take the amount recommended on the package. These can be purchased at most grocery stores. Changes in diet and lifestyle help to treat the problem. Like any other remedy, ginger should be used in moderation. Overuse may exacerbate the problem. You may also want to try green tea as a home remedy for acid reflux as a substitute. If your stomach is sensitive, always use a diluted form of ginger. Ginger is very effective for treating nausea in pregnant women. Consult a doctor to make sure you’re actually suffering from acid reflux. The recommended daily dose of ginger is 4 grams, and this can be used in any form. Don’t use ginger if you’re suffering from ulcers or bleeding disorders, or if you’re taking aspirin or blood thinners. Do not give ginger to children. Most store-bought ginger ales don’t use real ginger. Eating pickled ginger regularly will help prevent acid reflux. Ginger is the safest, most natural way to treat acid reflux. Other than ginger, oatmeal is a great home remedy for acid reflux as well. If it does not cure your symptoms, see a doctor immediately. Do you know of any other methods for treating acid reflux with ginger? Tell us about it! Why you do not recomend ginger for children? The quantities mentioned in the above article are stated as per the dosage for adults. If ginger is taken in appropriate quantities by children, it can cause nausea, diarrhoea or heartburn. I know for a fact that ginger works in relieving indigestion and sour stomach. I cook at home often and I always have a big root of ginger in the fridge. I also drink large quantities of beer so–food + beer = stomach trouble at times. When I don’t have any Pepto or Tums tablets to chew, I simply go carve off two to three slivers of fresh ginger, chomp them up and spit out the pulp. Within minutes my indigestion is relieved. I have really bad heartburn tonight. You know when it’s so bad that you feel like you’re going to puke? Well that’s what I’m experiencing right now and it’s almost 2am. I do have fresh ginger root and I think I will try China Mike’s remedy. I’m very tired and I don’t want to start making ginger tea. Thank you for this article! I have been suffering from acute acid reflux all day, everyday for past 1 week. Doing PPI and Zantac, alkaline diet, manuka honey, mastic gum…. but nothing seems to help much so far. I was having another build up of reflux (chest pains, burning throat and mouth heat, nausea) and desperately doing research online when I read your article – quickly made a simple ginger tea (grated 1/2 inch fresh ginger and seeped a few mins in hot water), then sipped on it — and IMMEDIATELY, felt my stomach more settled and the acid “heat” subside. This is amazing! I usually can’t take much ginger as it gives me a racy heart, but will try sipping a little ginger tea as recommended, 20 mins before meals twice a day. Can I have aloe Vera juice because I m taking medication (pentop tab) ?? Aloe vera can interact with some medications so it is recommended to consult doctor to know if the medicines you use react with aloe vera or not. I have had acid reflux for decades and have used various Rxs with varying degrees of less-than-total success. My current Rx (generic Zantac), provides decent but incomplete relief – I often need to take an antacid in mid-afternoon and/or in the middle of the night, to relieve heartburn.. Sometimes acid is regurgitated and partially aspirated, which gets really nasty! Recently, I started taking two ginger root capsules and a couple slices of pickled sushi ginger (gari shoga) just before going to bed. Since I started that regimen, I have had no reflux episodes at night or heartburn in the afternoon. I’d like to say that your article prompted me to do this, but I just stumbled upon it today, sorry.. OTOH, my experience does support the claims made in your article. Sometimes I feel like I have something on my throat and sometimes no I have tried a lot of medication and it still don’t go those that acid make you loose weight?what can I do to prevent it? Try any remedies mentioned above in the article to get some relief. Try to avoid bending or lifting any heavy items immediately after the meals, eat smaller meals frequently, avoid tight fitting clothes, avoid oily food, drink plenty of fluids and eat food rich in minerals, vitamin B-complex and folate as preventive measures. I’ve had acid reflux for almost 20 yrs and i was taking all kinds of ppi. For the last 2 yrs i’ve stopped with the ppi and started taking natural things for my acid reflux which i still have. I wanted to know how many mg of ginger root capsules is helpful to take daily? We recommend to consult a doctor to know the right dosage as per your medical history. I had bad acid reflux I take omeprazole but doesn’t help me ay all.. any one has idea to cure gerd!?? Noted that your article advised against using ginger if one if on an aspirin or blood thinner regimen. I take one 81 mg aspirin daily, along with a blood thinner, Brilinta. I also love ginger snap cookies and wonder if I should stop eating those or if perhaps there is not enough ginger in them to hurt? Ginger snap cookies usually don’t have enough ginger that can interact with the medicines. We suggest not to over consume them. And avoid eating them right after taking the medicines. Yes, now I can understand the way and amount to take it regularly. But I need to know how long should I continuously take it? You can continue until you get relief from acid reflux. Once you have no recurrences for a week or two then you can stop taking it. How about pickled ginger, like served at sushi restaurants? to stay away from acidic foods not eat or drink more!!! I also suffer reflux oesophagus, but now it’s worse because of menopause . Are they related in any way , I can’t sleep I cough throu the night, please help with the coughing.